This is one of the best organization ideas I've seen in a LONG time. I LOVE IT! 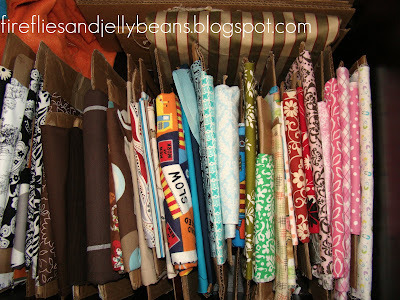 I'm totally going to organize my fabric like this! A great way to use up all the empty cardboard boxes in my garage and organize my fabric at the same time. You can find the tutorial here. Thanks for sharing, Fawnda! Two weeks ago, Taylor asked me "Mommy, when will I be able to have cow's milk?" This is not the first time she's asked me this innocent question. She does very well with her food allergies and is very accepting that she has allergies and she there are certain foods she can't eat. But every now and then, she'll ask that question in different ways "When I get bigger can I have cow's milk?" So, when she asked that day, we had an honest discussion about outgrowing allergies and that some kids outgrow allergies and some kids don't and the only way for us to know if she's outgrown her allergies is to feed her to the food she's allergic to. Her food allergies have never shown up on blood tests as she has milk protein intolerance (for which there are no tests). Her reactions are delayed by about 12 hrs so we plan our food trials carefully. As the day went on, I realized she'd be off school for the next week (she's been in preschool all summer), and she's been pretty healthy for the last 6 weeks or so, so it's a good time to feed her dairy and see if she's outgrown her allergies. Our GI doctor had given us the go-ahead to try dairy with her. Of course, if your child has an allergy, you should always consult their doctor before feeding them their allergen. Well, I'm thrilled to report that after a week of slowly re-introducing dairy, she had no signs of allergic reaction and we're saying she's officially outgrown her dairy allergy! We've proceeded in re-introducing dairy into her diet slowly because it's very common to become lactose intolerant after not consuming dairy for an extended amount of time. Her body should adjust to the dairy as it becomes a regular part of her diet. At this point, she's eaten yogurt, milk mixed with rice milk, sour cream, cheese, cheese enchiladas (which she doesn't really like), and pizza. In other news, we got the results of Taylor's scope and probe that I posted about a couple of weeks ago. I'm choosing to just take the results as another piece of the puzzle. It was determined that she has "non-acidic" reflux, and the GI doesn't think she needs any meds at this point. In all honesty, I'm a little frustrated because she still complains of tummy pain, and I'm not really sure what the culprit is. In the GI's words "we don't have a good reason for why her tummy hurts". He recommended a dietary supplement called Prelief, that she can take before she eats acidic foods because she definitely has reflux, and when she eats acidic foods, her reflux is painful. I also believe, based on her frequent complaints of tummy pain and based on what I've read, that non-acidic reflux is still very uncomfortable.